About me 01110000 01101111 01101111 01110000. Not a financial advise. Bitcoin Rally! Where does this take us? Doge is the new Ether. What's Your Craziest Idea in 2019? Between 28 and 38 million people used opioids illicitly, about 0.6% to 0.8% of the global population between the ages of 15 and 65. What is the most potent opioid of them all? The best ICO of all time! This is not a medical prescription. Trade at your own risk! Let me know what if its crazy enough! 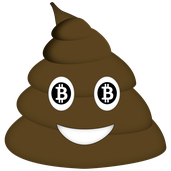 Your High Poop Trader! MDA: Break Out or Die!